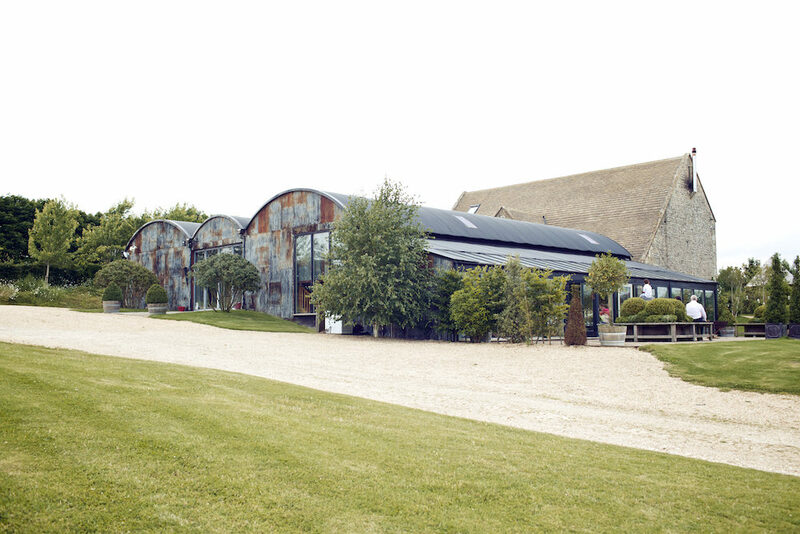 Gorgeous bride Kate married Joe Jonas, opppps I mean Rich, at Stone Barn, one of our all time favourite wedding venues. 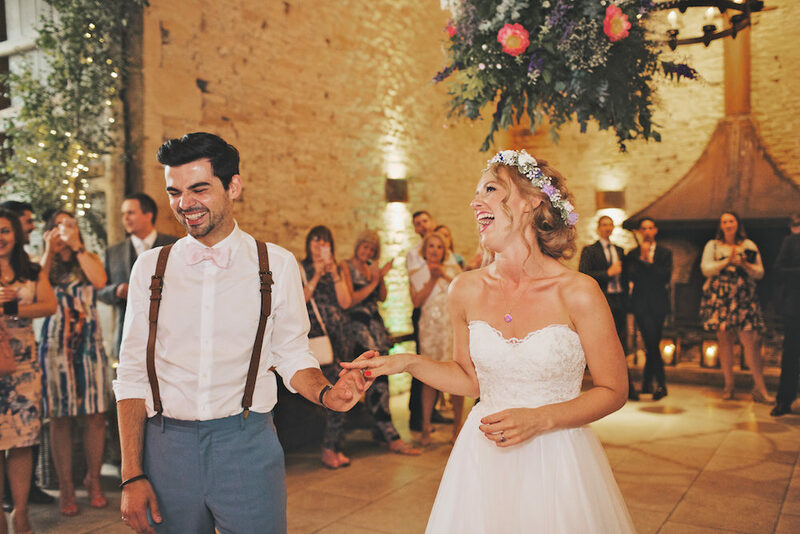 Filling the barn to the rafters with gorgeous blooms, rustic details and lots of live music, their wedding day looks like a proper party from start to finish. 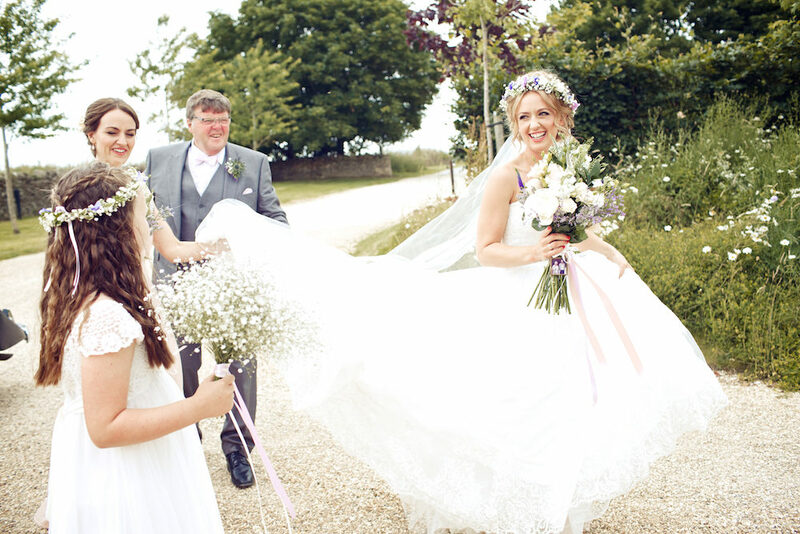 Kate looks absolutely stunning in her floral crown and relaxed up do, I’ve never seen such a radiant bride! And Rich looks rather dapper in his braces and light blue suit combo too, even taking to the stage a la his doppelgänger Joe Jonas. 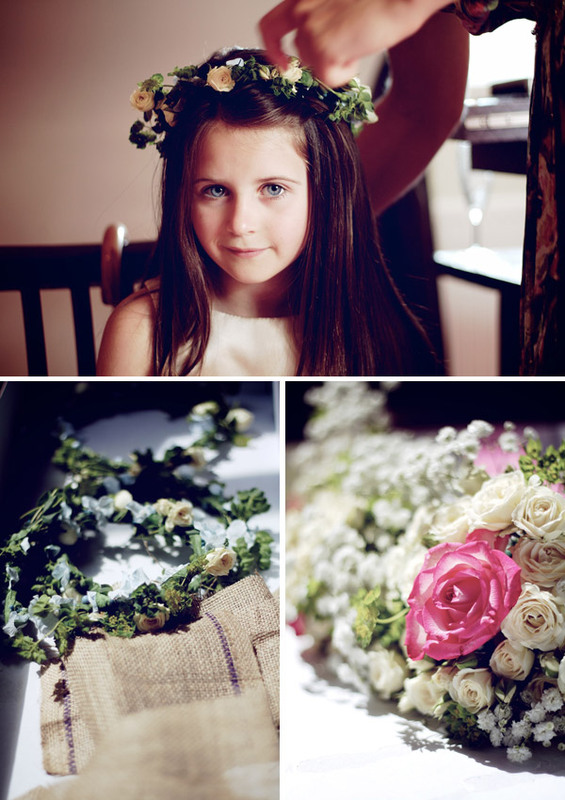 Images come from the wonderful Harriet at Weddings Vintage. 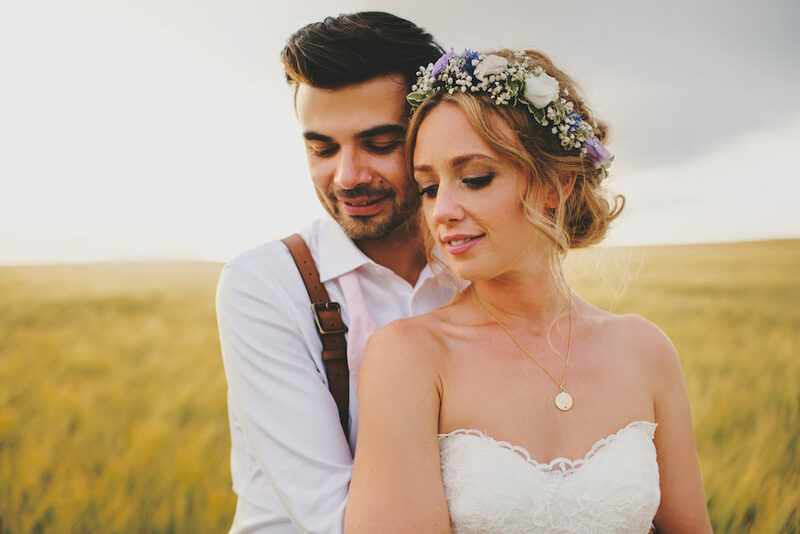 Make sure you soak up those couple portraits – THAT light!!! Swoon! 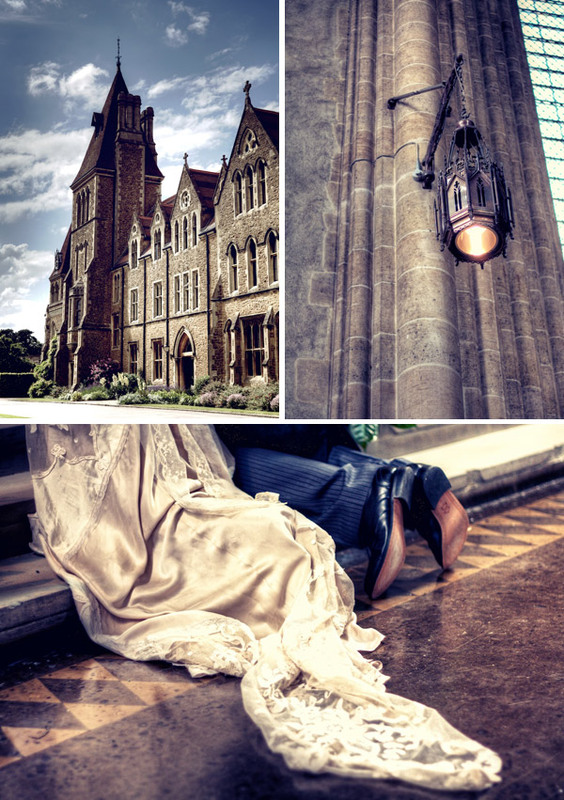 I always love featuring weddings that take place outside, especially when the couple are lucky with the weather. 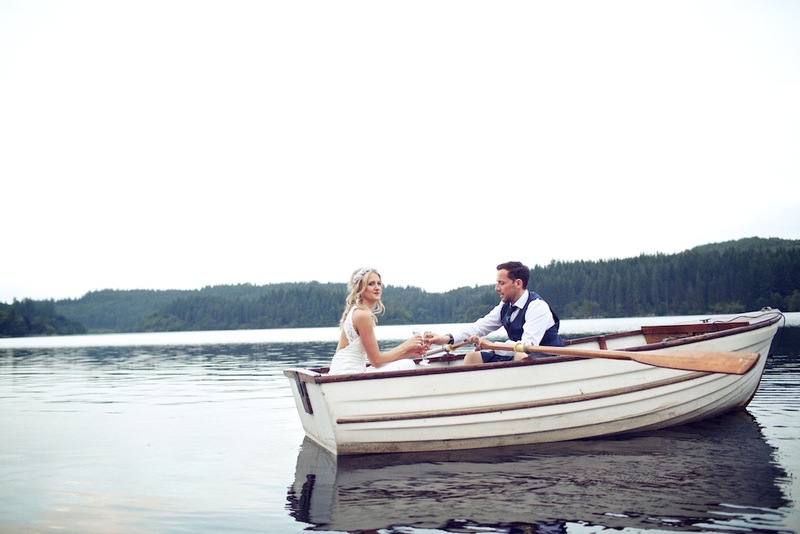 Heather and Bruce’s big day, held next to a Scottish loch was bathed in glorious sunshine – or at least it looks that way in the images by Weddings Vintage 😉 We’re always so envious of our Scottish couples who can legally marry in the great outdoors. 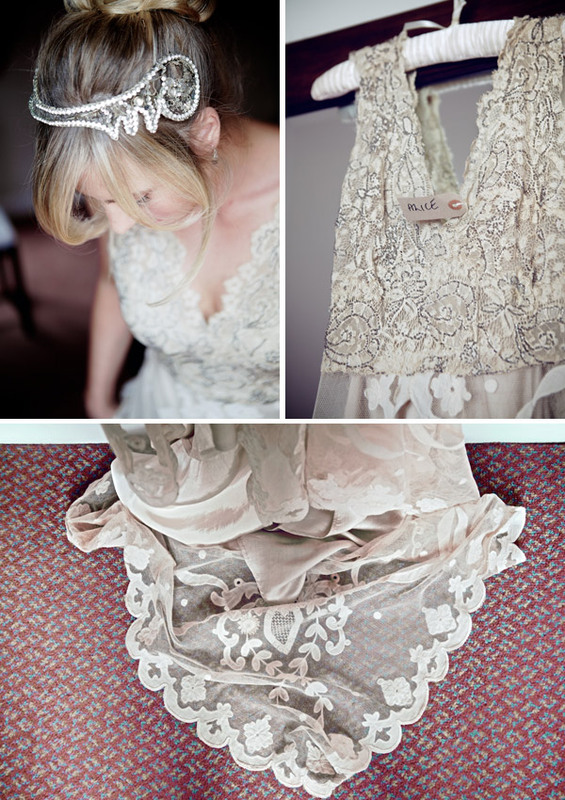 Well hello there super swishy gorgeous bridal frock! 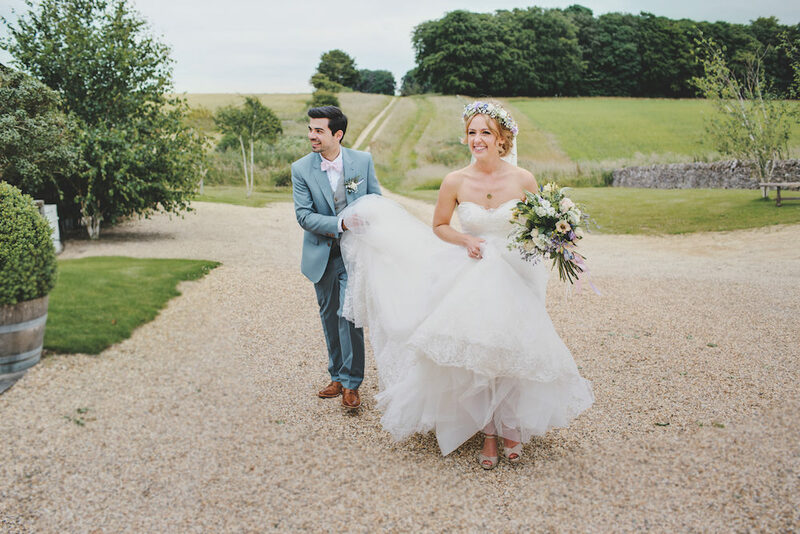 Beautiful bride Lauren went all out on her silver and white colour themed wedding day, to her boy Sean, opting for the very gorgeous Payton bridal gown by Charlie Brear. I say bridal gown but actually it was a dress paired with the Isere skirt from the same bridal brand over the top and it looks amazing! 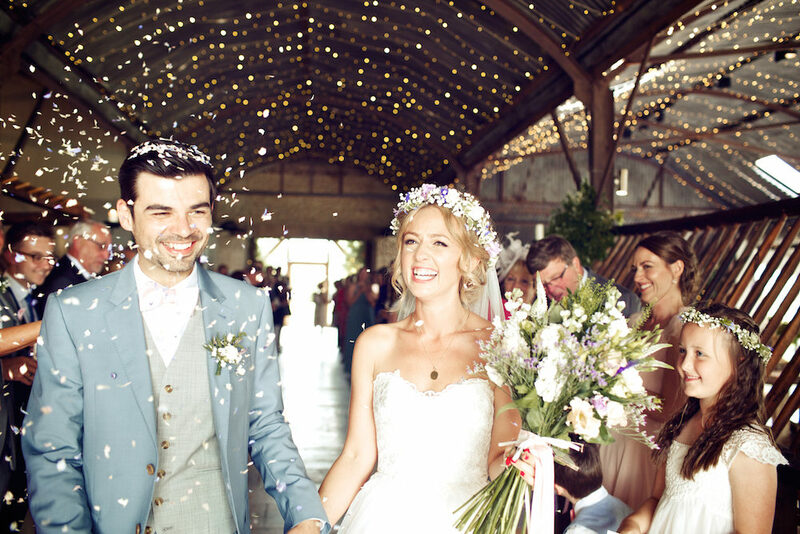 The twosome said their vows at Hackney Town Hall before partying on down at London Fields Brewery complete with twinkly fairy lights and the most amazing florals. 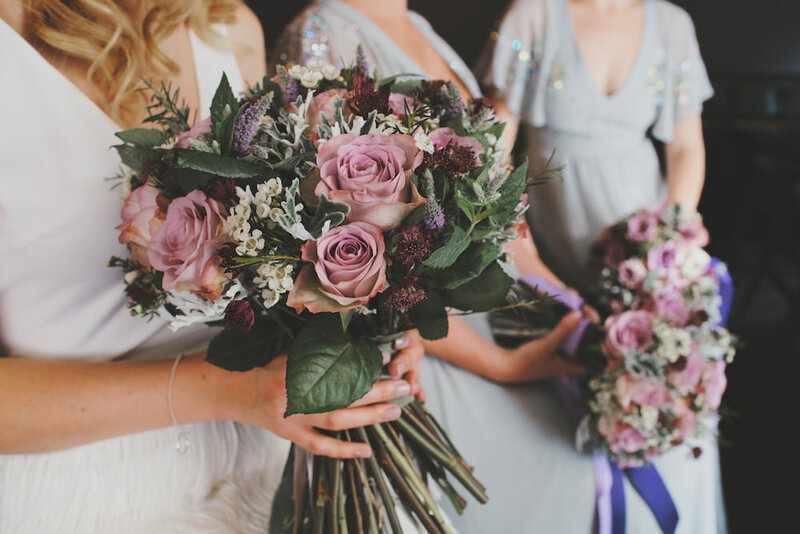 Check out Lauren’s bouquet- just beautiful! Hands up those of you who entertained the thought of a blush pink wedding dress when choosing your big day frock. Yep thought so…me too! Whilst I didn’t find one in my own hunt, bride Sinead was a darn sight luckier than me when she popped along to Charlie Brear’s boutique. 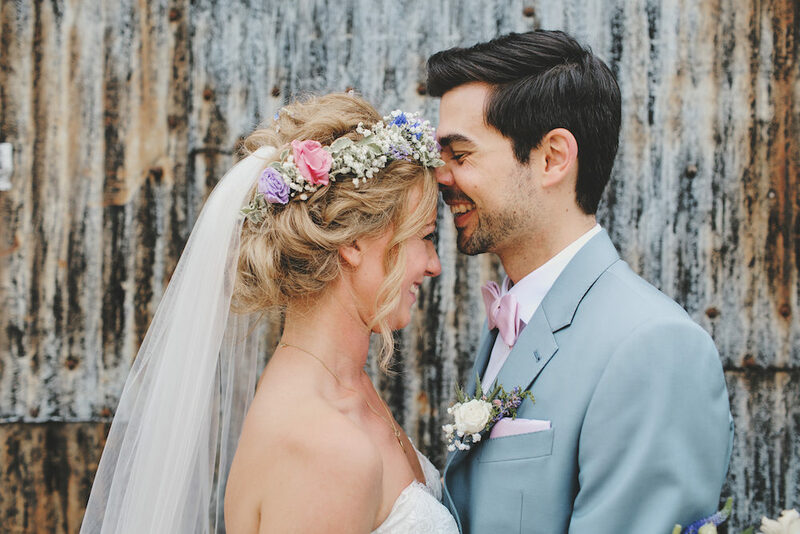 Sinead married her boy James and celebrated their union at Balham Bowls Club in London with a pale pink, blue and ivory colour scheme which looked pretty darn awesome. I particularly loved Sinead’s gift to her husband on the morning of their wedding – a vintage sapphire tie pin to complete his big day look. She snuck it into his jacket pocket with a little note for him to find when he was getting ready. How cute is that?! I love a good international love story and Rob and Susie’s round the world romance is no exception. Meeting in Australia, getting engaged in Barcelona and then marrying in Wales is definitely one way to get in all the sights. Susie’s Suzanne Neville frock is beautiful,fits her like a glove and looks positively dreamy amongst the woods at Tros Yr Afon. I love the fact that she chose to incorporate some of Rob’s grandma’s hairpins into her do on her big day – such a beautiful touch. And a first dance to Let’s Get It On? Genius! I do not know what is going on lately but I am getting to share THE most amazing weddings with you. I mean, our weddings are always awesome but of late I am blown away by what I am seeing. Today, I am mainly blown away by Caroline’s smile. She might be the happiest bride I’ve ever seen. 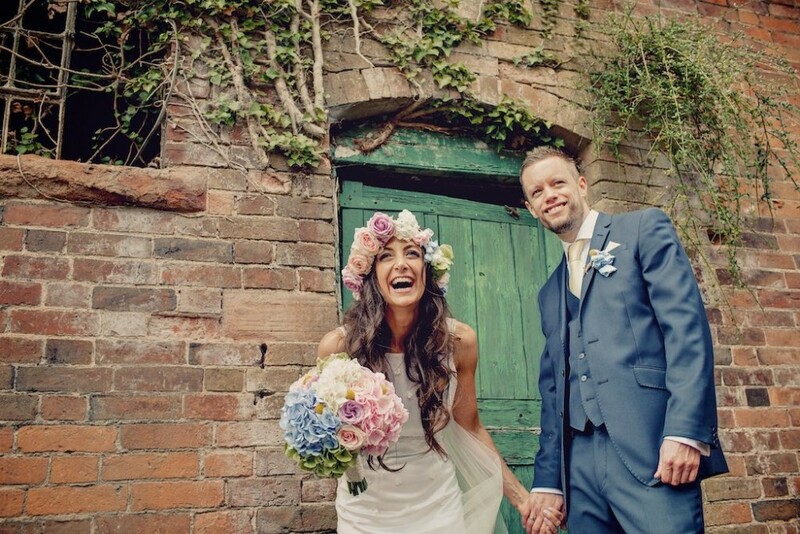 Caroline and Rob married at Shustoke Farm Barns in Warwickshire. 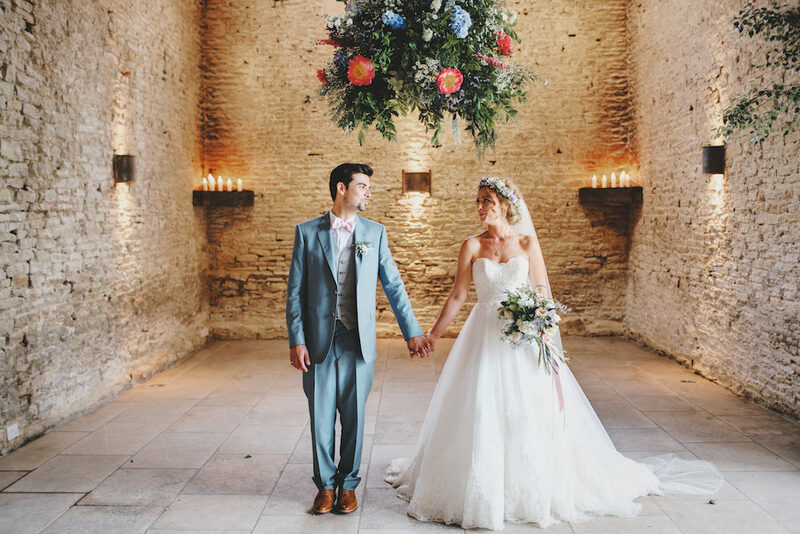 With flowers by Passion For Flowers and a Charlie Brear gown to die for this wedding is simply immense. To quote form one of their readings “Love lets you find those hidden places in another person, even the ones they didn’t know were there, even the ones they wouldn’t have thought to call beautiful themselves. ” Need I say anymore? A Groovy Kind Of Love. Rock My Wedding readers Glesni and Owain Lloyd married on the 12th of August, 2011. 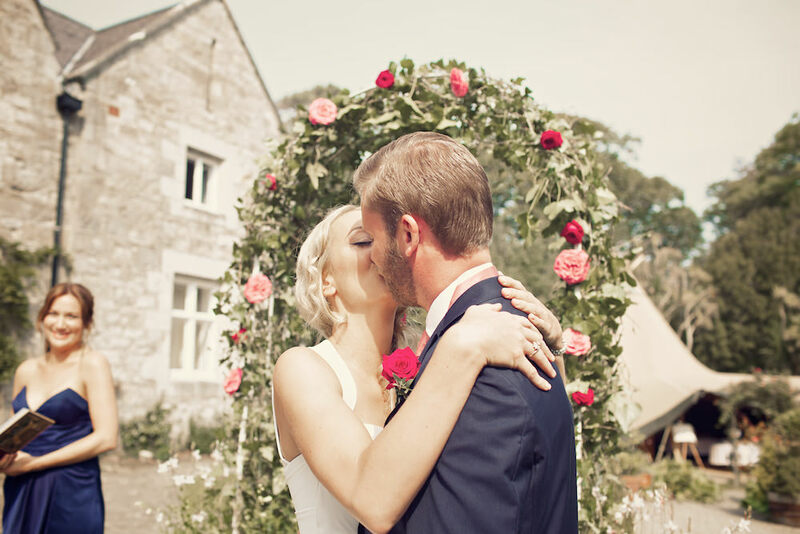 The ceremony was in their local church in a small and rural village called Betws Gwerfil Goch in North Wales. 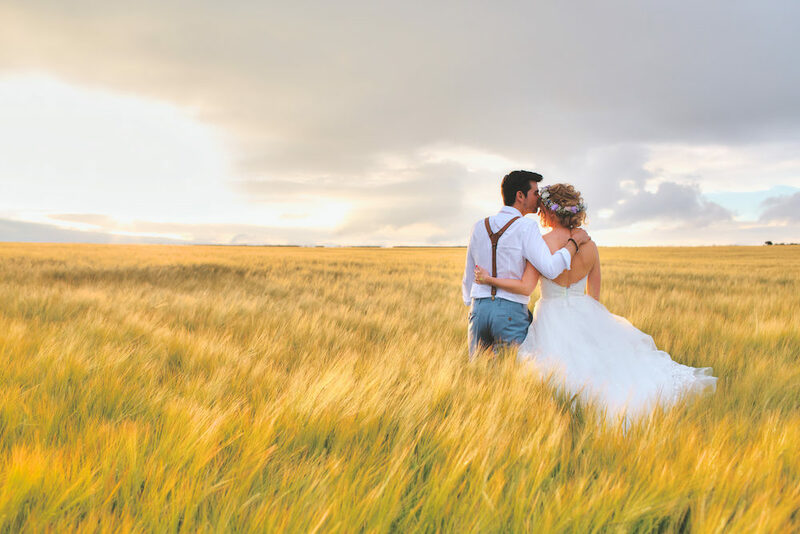 At some point early on my Jaw had dropped – and there it had remained as I soaked up not only the amazing camera work but also the stupidy gorgeous wedding stationery. 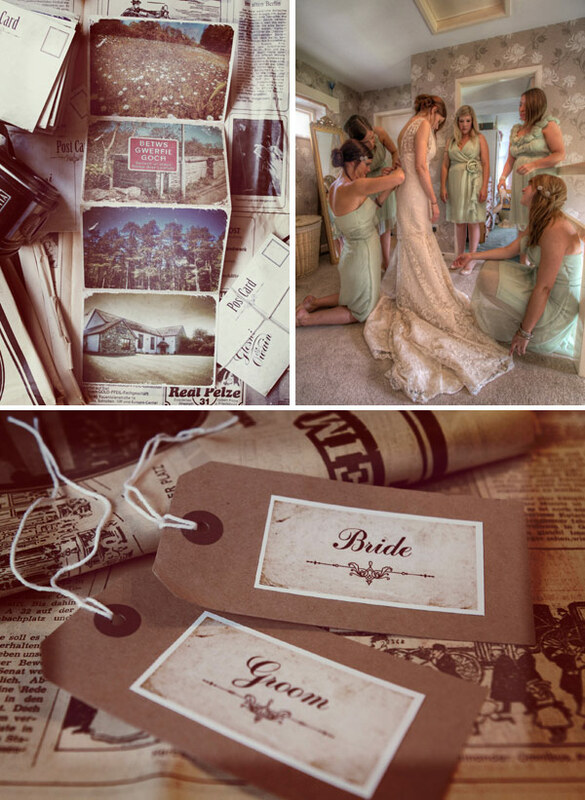 You see Vintage Weddings is a collection of super creative people and not only will they shoot your wedding and make it look fabulous, they will also create you some seriously-to-die-for papercraft too. 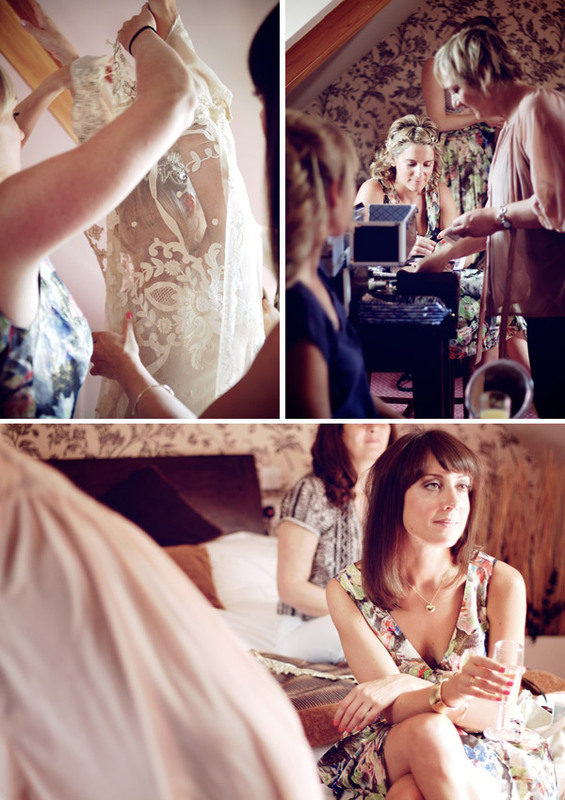 The dress was Charlotte Balbier, Tabitha in vintage gold from Belles Bridal Boutique, Liverpool. I loved the vintage style of the shop and Geraldine the owner was so lovely, I new I had to buy my dress from this shop. My hair piece was from Untamed Petals, and called a ‘poppy double headband’. I wanted a vintage and natural look and this headpiece gave me the look I desired. My shoes were from Rachel Simpson, mimi. I tried them with my dress fitting and I loved the way they looked and they were so comfy. I went to a local hair dresses in Llangollen for my wedding hair, I just needed a natural up do, no frills. I decided to do most of the floral decoration myself; the local flower shop sourced the flowers for me. My bridesmaids, mum and mother in law and I decorated the hall all Thursday. It was a lovely but very busy day with everybody mucking in. We made our own bouquets, I was much easier to achieve the look i wanted. I’d made a scrap book full of ideas, which was a great reference book. I had 5 bridesmaids and 2 flower girls. I bought the bridesmaid dresses from a shop in Cowbridge, South Wales called High society bridal. 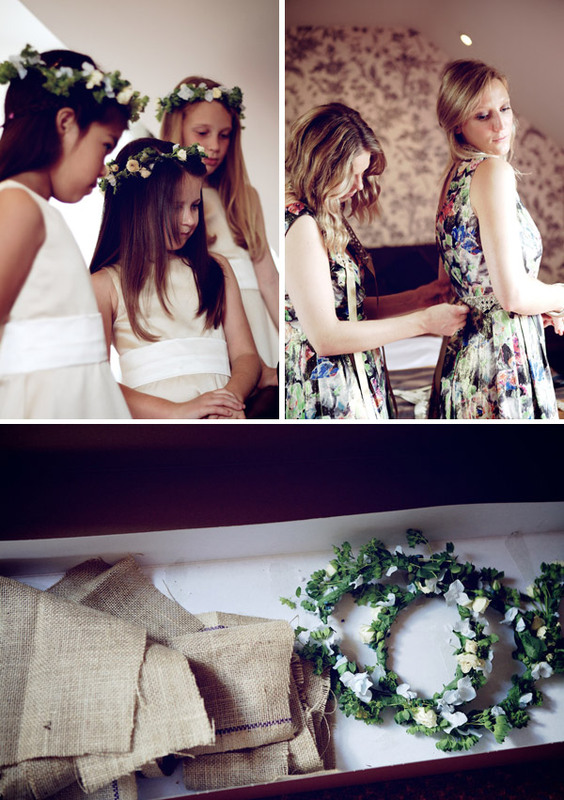 Since all the bridemaids we’re around the same age, I wanted dresses that would suit them and choose the Lela Rose , crinkle chiffon collection in Mint and the girls decided on the style they liked and we went for 5 different styles, for a more natural, less uniformed look. The groomsmen attire we hired but we bought them gingham ties. Owain had always wanted to a bow-tie , so we found a grey bow-tie in Topman. He looked so happy as I walked down the aisle, the whole day was perfect for us. I wanted a photographer that could capture the natural, vintage style I was hoping to create. The photographer was important to me and I spent hours on hours surfing the internet. 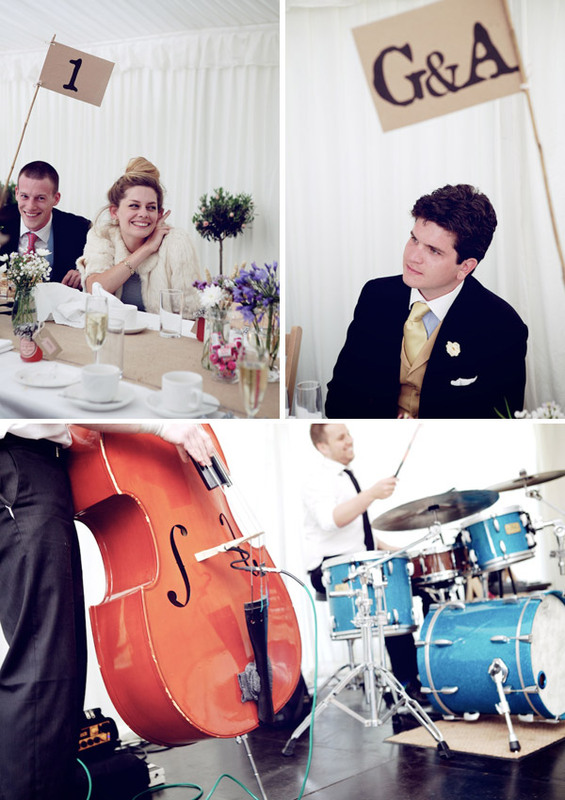 Somehow I came across the Weddings Vintage website and fell in love with their previous wedding photography. I sent an e-mail, and talked on the phone to Harriet, I knew she was the photographer for me. We shared some ideas and I new she understood the feel and look I was going for. Harriet was amazing during the wedding, she meet up with us on Thursday afternoon, and took some photos during our practice in the church. 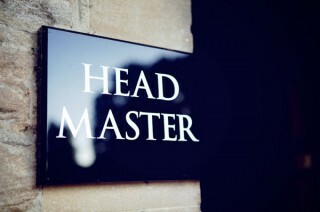 She had a lovely and warm personality and I trusted her instantly. We love our photos. Finding Weddings Vintage was a blessing. 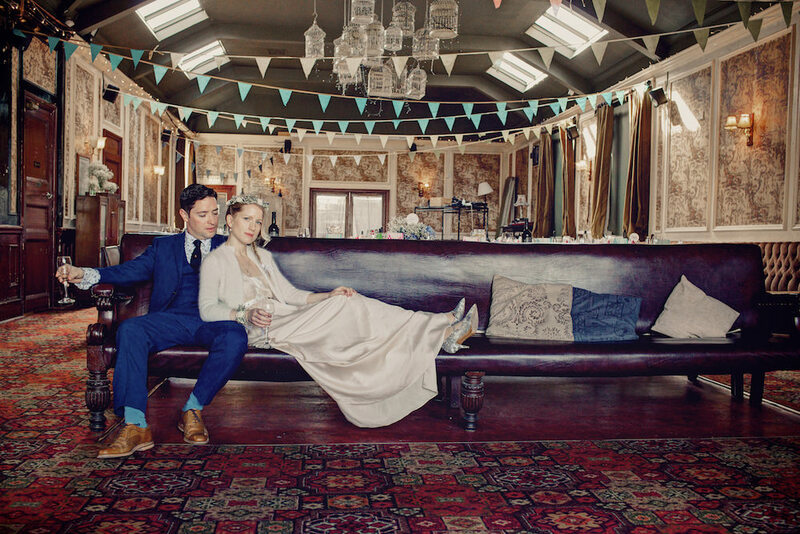 Hayley the designer, helped me create the perfect wedding stationery. I love post cards, and I wanted invitations that captured the feeling of our wedding day, and the beautiful scenery of home. I took some photo’s of my church, the village hall, the field in front of my house which holds so many happy childhood memories and the trees that all the guest would drive through on the way from the church to the village hall. I sent them on e-mail and asked for a vintage postcard design. I was blown away with the invitations, they were perfect, we had so many compliments about them, and we couldn’t wait to receive the rsvp postcards. They set the tone perfectly for the wedding. My mum made our fruit cake, my sisters and I decorated it simply with lace and wooden pegs. My bridesmaid made some cupcakes and decorated them with berries, they looked beautiful. We hired a swing band Called Dr Jazz from North Wales. They were amazing a hit with young and old and just completed the night perfectly. My husband choose the song and played it to me on youtube, and I instantly loved it. It was A Groovy Kind of Love from Phil Collins. We’d been together for 9 years and our relationship has always been chilled and relaxed and foremost we’re great friends. Our second song was Pencil Full of Lead by Paulo Nutini, I love that song and it was great to kick of the party mood. We didn’t go for any favours. I just wanted to keep it simple but I collected a cup and saucer for every guest and placed the name tags on them. It was great seeing people sharing a pot of tea and reminded me of community events when I was young. Decoration was really important to me. The village hall gave me a perfect canvas to decorate the hall as I had imagined. 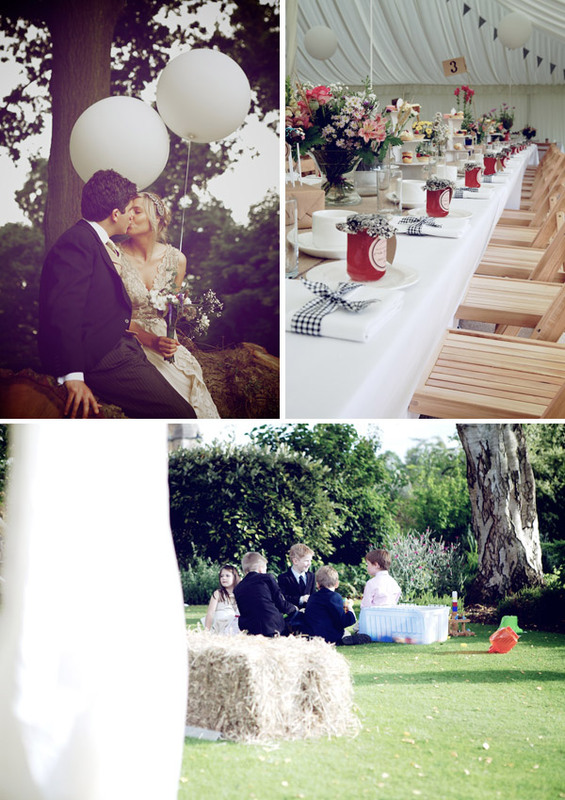 I’d collected a scrap book full of ideas, and decided we wanted long trestle tables to create a village fate feeling. We decorated the tables with candles and flowers. I collected a tea cup and saucer for each guest, a hundred and thirty. I went around charity shops and asked family members – they loved that they could help. I wanted a relaxed garden feel where people could chill in the conservatory, so we hired a company called Posh Frocks and Wellies from Chester to decorate, they bought odd chairs, lamps, bunting etc and it just gave the room character and it fitted in great with our odd and ends. They we’re great and came to finish the work the morning of the wedding, since a whist tournament was taking place that Thursday night in the conservatory. The locals all loved having an opportunity to have a peek at their hall transformed. We hired a company called stephanotis to drape the hall and hired a company called Outside from Conwy to cater for us. Their food was amazing, we had pate followed by steak, new potatoes and salad and nickerbocker glory for pudding, followed by homemade pies and hot dogs at night. Our friends and family made our day. It was so lovely to have them all together celebrating with us. 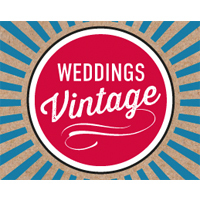 My advice would be to make a scrap book, It gave me the confidence to go for a vintage wedding. Rock My Wedding was a weekly fix, and inspired so many of my ideas. Having so many people helping and contributing to the wedding made it extra special. 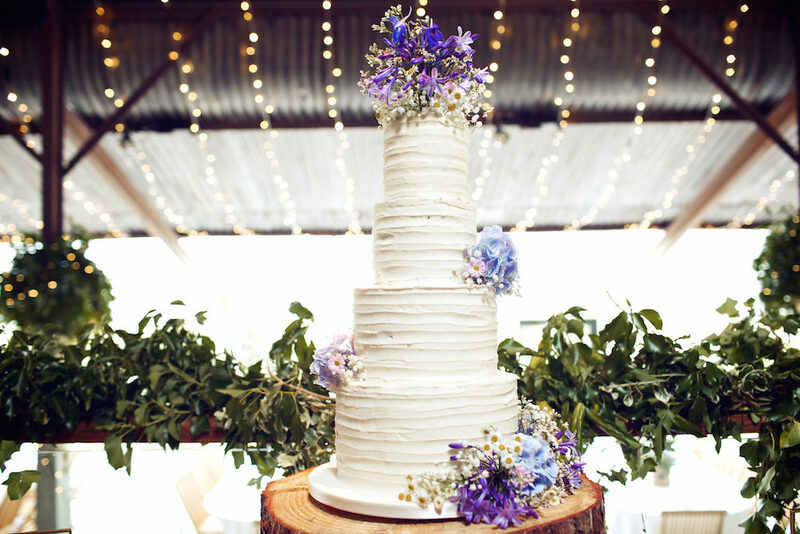 I love being creative and loved the opportunity to be able to make our special day perfect for us. The Charlotte Balbier dress combined with the hair piece from Untamed Petals is a genius combo. So much that I like about this wedding but I am going to hold back and just talk about my geeky passion… The stationery. 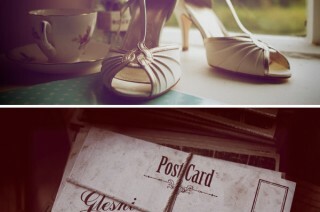 What a great idea to take shots of your surrounding area to create a collection of postcards. 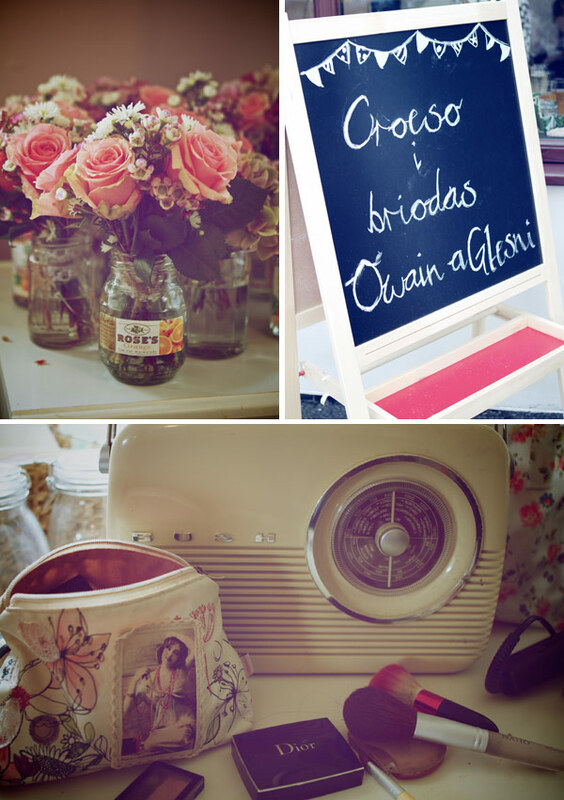 And how beautifully executed by Weddings Vintage. 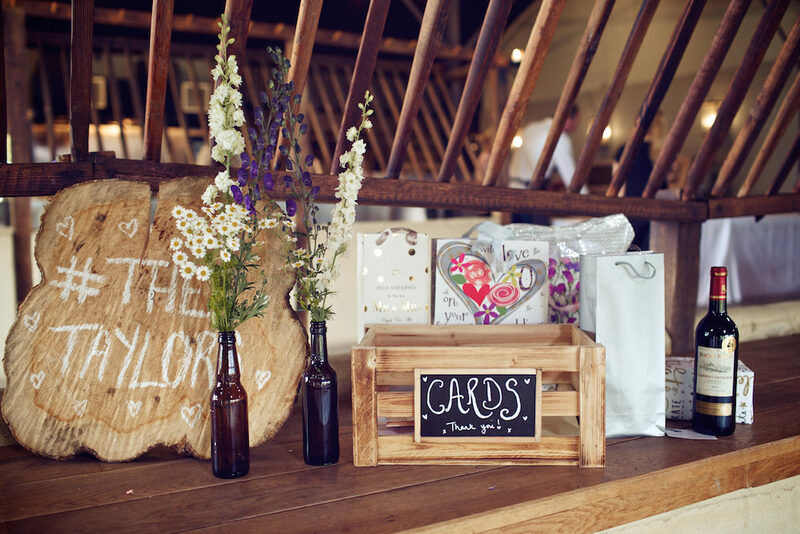 The Order of service right through to the table numbers and menu cards have had the same carefully considered treatment and they really do bring all the elements of this amazing vintage inspired wedding together.